Nikon has announced its latest DSLR camera for photography newbies. The Nikon D3100 not only can shoot wonderful still photos in full 14.2-megapixel glory, but can also shoot video clips in high-def 1080p MOV format at 24 frames per second. This updated version of the D3000 has features for those who want to start out with a DSLR camera, or with photography as a whole. It has auto modes for virtually every aspect of shooting, including a “Guide Mode” that apparently provides the user with “sample images of what (he or she) can achieve with certain settings.” An example provided is what the photo is supposed to look like if the user changes the shutter. Photography experts can still appreciate this camera even with the auto mode turned off, especially with its ISO 3200 range, 11-point focus, and especially the video mode. In addition, an array of lenses has also been unveiled by Nikon to aid its D3100. First on the list is the AF-S NIKKOR DX 55-300mm with ƒ4.5-5.6 VR (US$400), AF-S NIKKOR 24-120mm ƒ4G ED VR ($1,050), AF-S NIKKOR 28-300mm ƒ3.5-5.6G ED VR ($1,300), and AF-S NIKKOR 85mm ƒ1.4G ($1,700). The 55-300mm has a very long and unusual zoom range. Its price puts the lens in the budget category. The last one, meanwhile, has an odd setting especially while similar lenses cost much lower. The priciest lens among the four comes with an autofocus motor, which means faster focusing, as well as a focus-mode switch on its side. 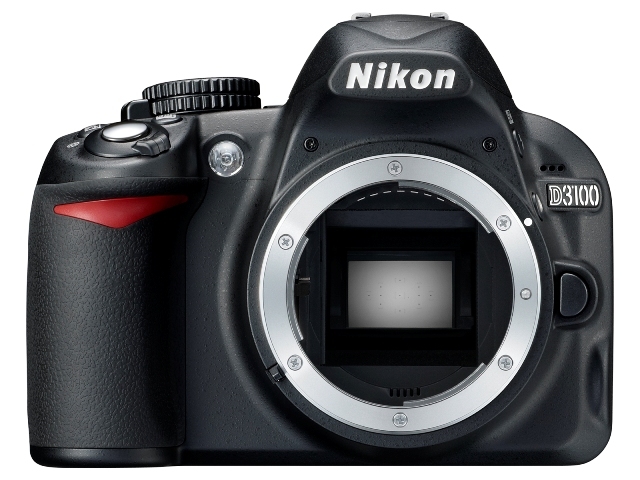 The Nikon D3100 is set to become available on September at authorized dealers, costing $699.95. Meanwhile, the compatible lenses provided are now officially available online.